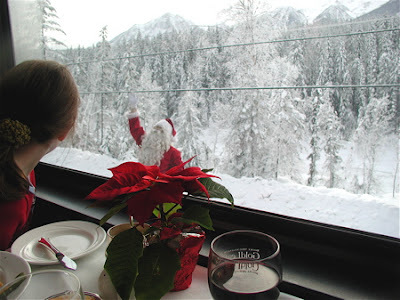 Santa appears alongside the Rocky Mountaineer. Sue Frause photo. Third time's a charm for Rocky Mountaineer Vacations (RMV), owners and operators of Canada’s acclaimed Rocky Mountaineer train. For the third year in a row, Rocky Mountaineer Vacations has won the prestigious World Travel Award as World’s Leading Travel Experience by Train. The pretigious 14th annual World Travel Awards gala was held in Turks and Caicos earlier this month. Tourism leaders from around the world attended the event. Other nominees for the award included The Blue Train (South Africa), Rovos Rail (South Africa), Great Southern Railway Ltd. (Australia), Palace on Wheels Inc. (India), Orient - Express Ltd. (U.K.), Orient Express (Peru), Grand North Western, The Royal Scotsman (Scotland). I've been aboard the Rocky Mountaineer from Vancouver to Calgary in both summer and winter. It's one of my favorite ways to experience the beautiful scenery of British Columbia, the Rockies and Alberta.